A Greenhouse Around the Corner is all about providing useful energy efficiency information and resources to the adult and community education sector. The Greenhouse around the corner TV series was a spin-off of the Channel 31/Digital 44 series A house around the corner, which showcased the incredible range of educational programs and community activities available in community houses all around Australia. Everyone comes to energy efficiency from different perspectives. Some will be just starting on their energy efficiency (EE) journey – others will be on the look out for new energy efficiency measures to implement. Regardless of where you are coming from, it’s important to make an energy efficiency plan. 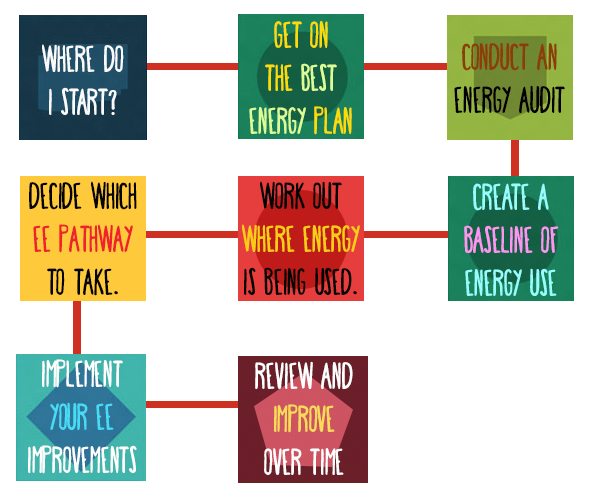 This will help you collaborate with others; clarify your centre’s requirements; measure the energy used in your centre and make some decision about which energy efficiency pathway you need to start. The chart below outlines some simple steps that you can take to develop an effective EE plan. Byron Region Community College completely retrofitted a derelict electricity depot, embedding best practice in terms of energy efficiency design and innovation. Learn how they achieved some amazing energy efficiency results, in our first episode of A Greenhouse Around the Corner. Heyfield Community Resource Centre developed and introduced the unique flag program which saw businesses and homes assessed for their energy efficiency. Over 380 homes were assessed and consequently made changes to their homes and businesses to make them more energy efficient. These changes started off as small changes but the community came to see the benefit and made more and more changes. Pomona and District Community House’s old stationmaster’s home has been retrofitted with energy saving devices and the new building/extension was built with energy saving in the plans. The new building took 7 years in getting to build stage through persisting with different approaches to gain approval and to gain funding. The Grove Precinct is Western Australia’s first public building incorporating innovative environmentally sustainable design features and technologies. The Encounter Centre in South Australia offers programs for people with disability. They use energy efficient practices and technologies to save money to help them continue with their innovative learning programs, which includes producing wonderful wooden toys. Greenhouse around the corner followed Coonara Community House located in for a six month period as they went through the process of implementing energy efficiency solutions to a beautiful stone cottage built in the 1860s and their other buildings. If you need more information, click each topic below for further resources.